In today's job market, it's not just the jobseekers that have to catch the employer's eye, but the employer also has to be able to make sure that his job posting is seen by the right candidates. The reason is the multiplicity of job boards and other online options such as social networks, which give the job seeker a lot of choice when looking for a job. In the process they are inadvertently missing out on seeing your job posting. This makes it all the more important for you to make sure that you avoid making these mistakes. 1. Do not go keyword-crazy: Keywords are important. But not at the expense of the message. Just as you wouldn�t take a resume filled with half a page of keywords seriously, job seekers are also unlikely to take you seriously if most of your job description consists of keywords and phrases. This makes your job posting sound like that of a recruiter or spammer who just wants to collect resumes. 2. Do not use unconventional job titles: Weird job titles are supposed to be the in thing. But as is common with most �in-things�, they become cliche and passe. You should use specific job titles but not terms like �rock stars� (unless you are actually looking for a rock star!). 3. Do not just list the usual benefits or leave out salary information: Healthcare plans and 401(k)s are important, but advertising the small perks and the occasional treats that your employees get is a good way to show that you are a fun place to work and value your employees. Job applicants are also more likely to apply to your job posting if you give out salary figures or at least a range. Even using terms such as �salary negotiable� and �competitive pay� will give you better results than not listing anything at all. 4. Do not write out the entire job description in one long paragraph: Most job applicants are quickly skimming through all the job listings and usually do not read the entire job description the first time around. So it is important to have your listing presented in a format that makes it easier for the applicants to get the gist of what you are saying, and one big block of text is not the way to do it. Be sure to include all the necessary information such as contact information and any clearances if they are needed. 5. Do not keep tight deadlines when posting jobs: Plan in advance and keep the job posting open for a few weeks if you want to get a good amount of applications. At a minimum, your job posting should be online for at least a week to get a good response. 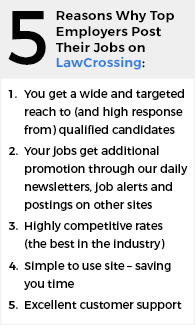 If you keep open your listing for just 2 business days, then you will likely be limiting yourself to a very narrow applicant pool whose main quality would be that they were the first ones to see the posting. Also, be sure to proofread your job description before posting it. If your job posting has spelling mistakes or inaccuracies then that will undermine your own creditability. Most job boards give you the option of posting a job listing under multiple categories. If your listing can be filed under different industries, take advantage of that. This will increase your visibility.